Imagine if $20 was a barrier to you sending your daughter to secondary school. I’ve written before that many of the girls receiving a scholarship in Sherbro Foundation’s Girls Scholarship program might not otherwise be able to attend secondary school because their families can’t pay the $20 annual school fees. But I haven’t showed you an actual village these girls come from and what their lives are like. 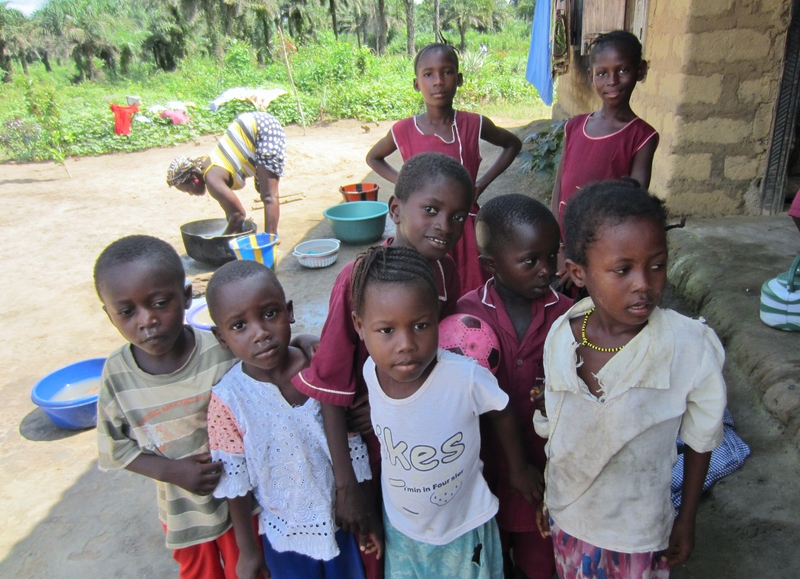 So, here’s a little tour of what it’s like to be a family living on $2 a day in a small subsistence agriculture village in Sierra Leone. You can click on each picture for a larger view. 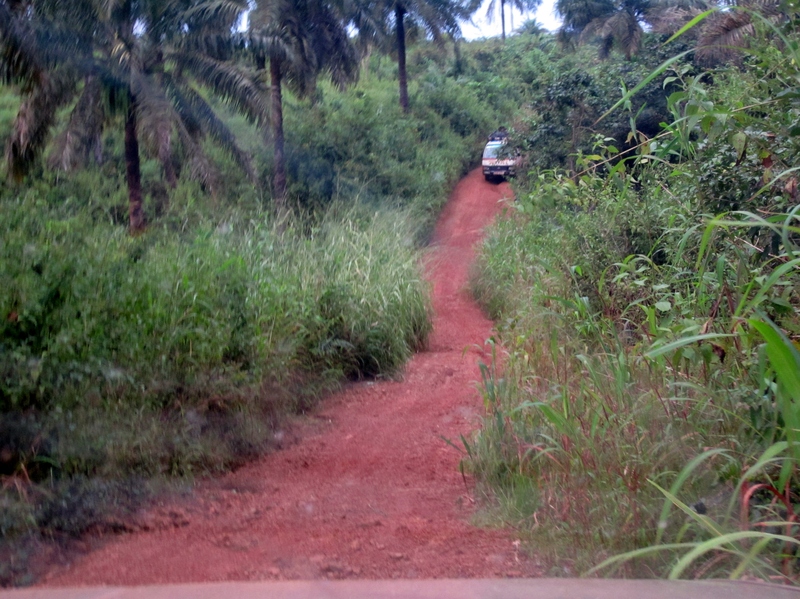 We are on the road from Rotifunk to Mokairo, a small village where the road dead ends in the southern reaches of Bumpeh Chiefdom. The road is narrow with little visibility from wild grass overgrowing the road. You need to be vigilant, watching for other infrequent vehicles. You’re more likely to have to dodge a motorcycle taxi, goats or farmers on foot. The area is lowland tropical rainforest, with many natural wetland areas that swell and shrink with the rainy season. Forty inches of rain is an exceptional year where I live in Cincinnati, Ohio. This area gets 120 – 140 inches. Great for growing rice; not so great for people and establishing towns of any size. When you see the land, you know why maps of this area are largely blank – unlabeled. This is a traditional farming area of tiny villages, too small to be marked on most maps. 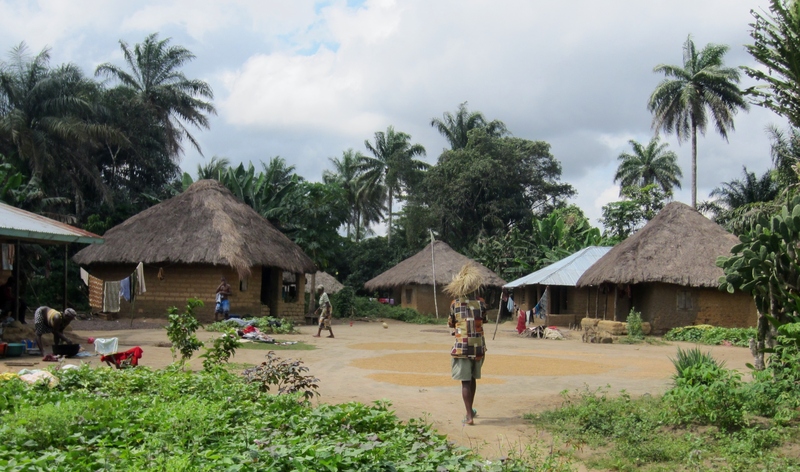 This is one of the most rural parts of Sierra Leone where life goes on much as it has for hundreds of years. 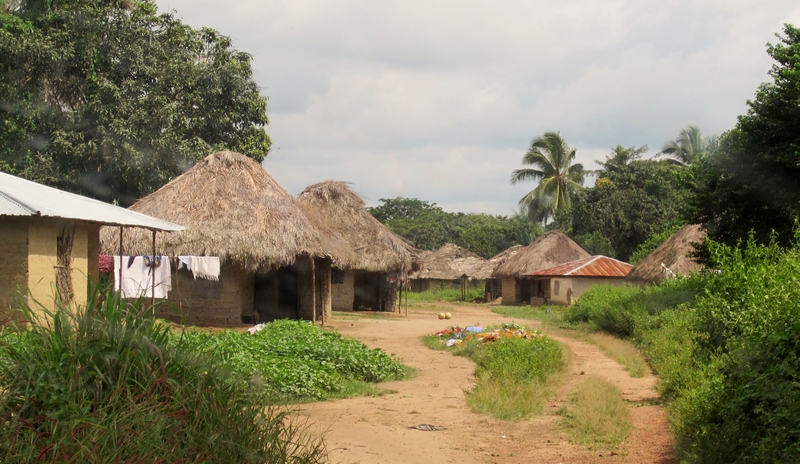 We pass a number of small villages like this one, which is one of 208 villages in Bumpeh Chiefdom. Usually about twenty houses, more or less. Mud packed on a frame of tree branches is standard construction, which won’t last too long in this rainy climate. Here’s a house either being repaired or expanded. The biggest complaint I hear from people here is they need money to buy a zinc metal roof. 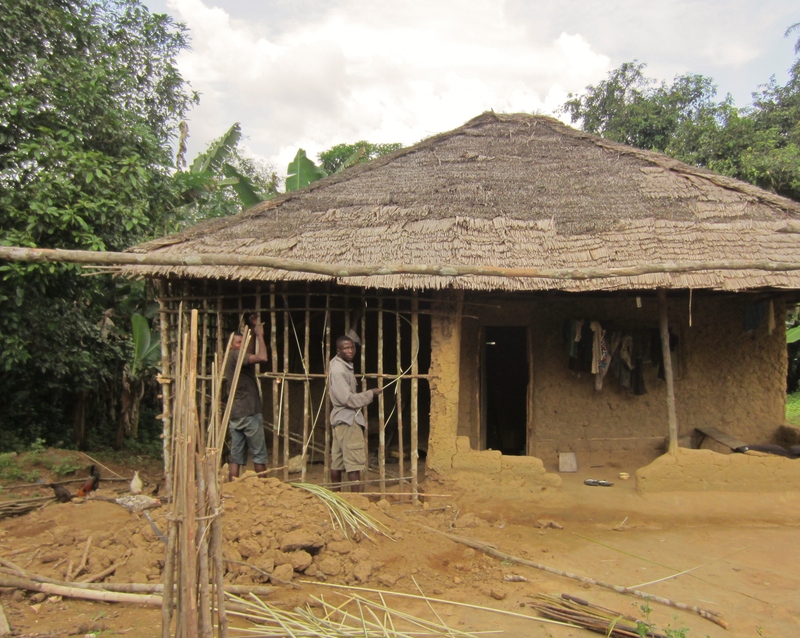 Their thatch roof leaks and it’s miserable in the rainy season. The end of the road is Mobainda village, where I stayed. We walked the half mile over to the next village, Mokairo, and met met families of girl scholarship students. 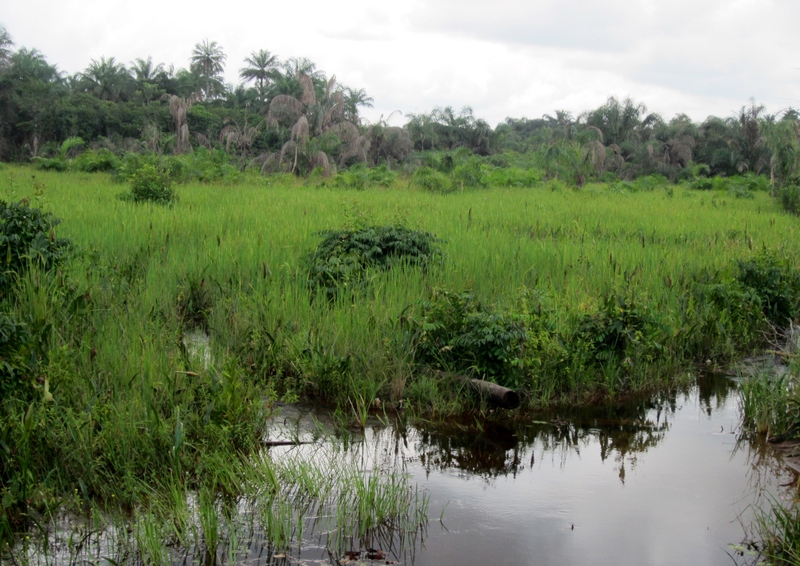 Mokairo is a bit off the road among rice farms – both swamp rice and upland (dry) rice. Here, we’re entering the center of Mokairo, a typical village of dozen or so houses. 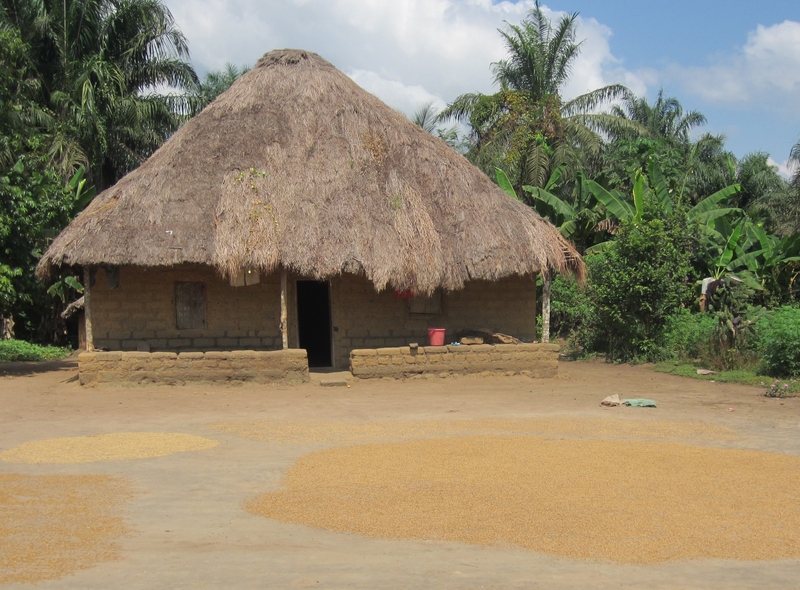 Someone’s harvested rice is invariably spread out to dry in the central area that most houses surround. The Bangura’s live on the corner as we enter Mokairo. Their daughter, Aminata, has received a scholarship to Prosperity Girls High School. 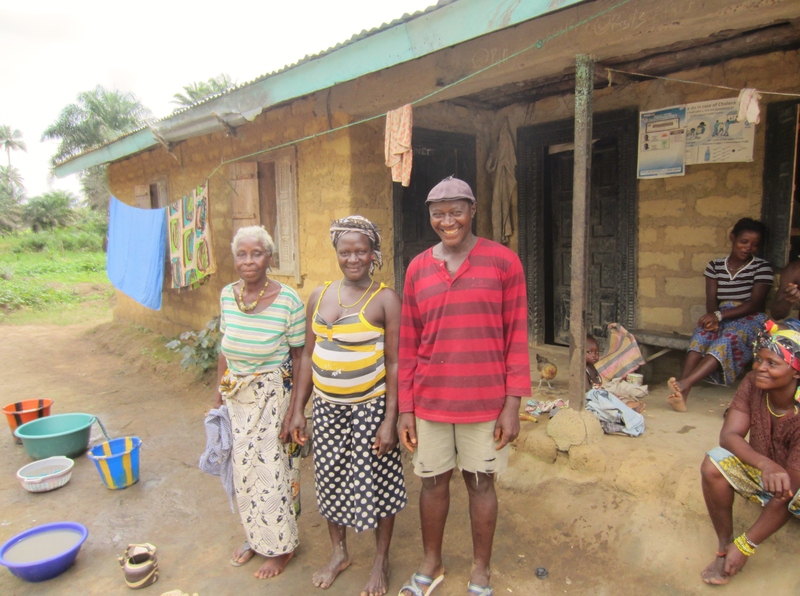 The Bangura’s, like their neighbors, are farmers and live as a multigenerational family. Mr. & Mrs. Bangura are here with one of their mothers. There’s usually only a few extended families in a village, and they’ve lived here for generations. 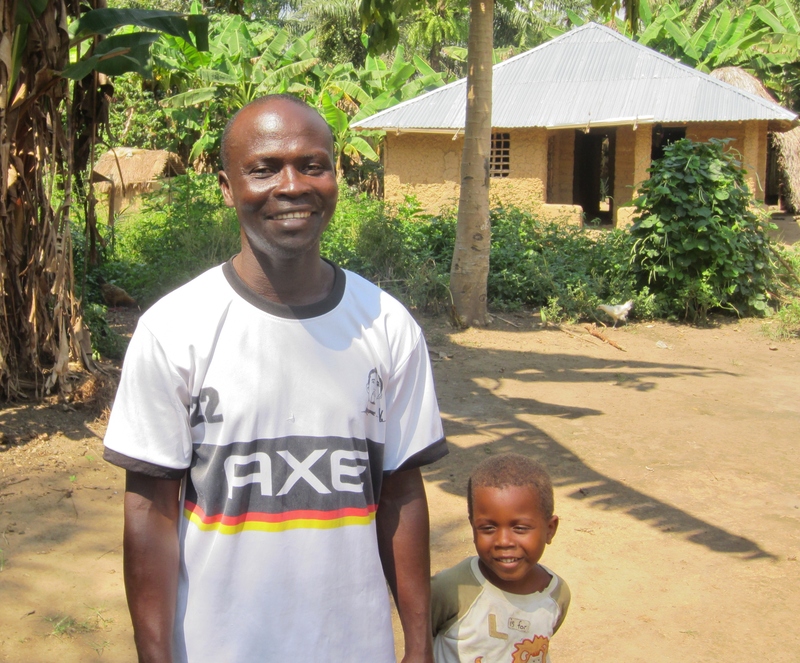 Mr. Bangura proceeded to tell me he was proud to have his daughter attend secondary school, even if that meant she had to leave her home village to attend school in Rotifunk. Mokairo together with several nearby villages can support a primary school, but not a secondary school. 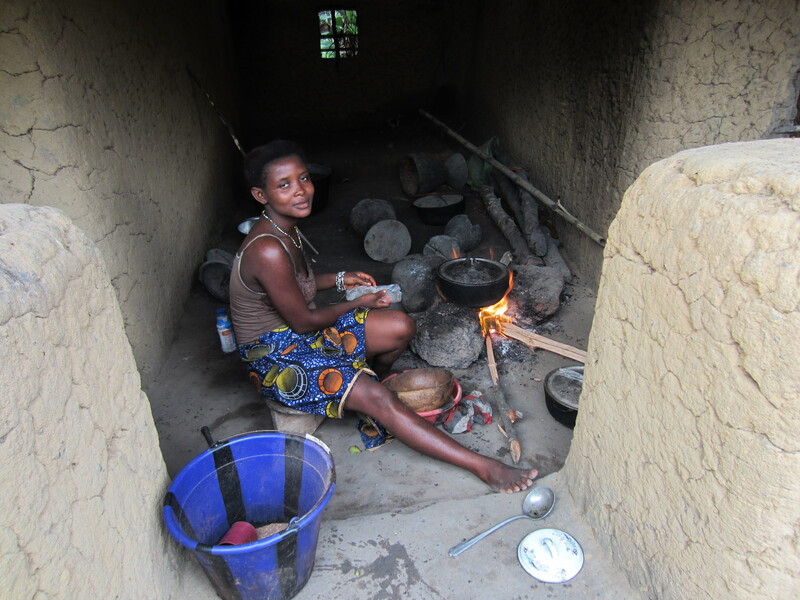 Mrs. Bangura went back to finishing her laundry in a plastic basin as we talked. Primary school students who had finished the school day crowded around us. 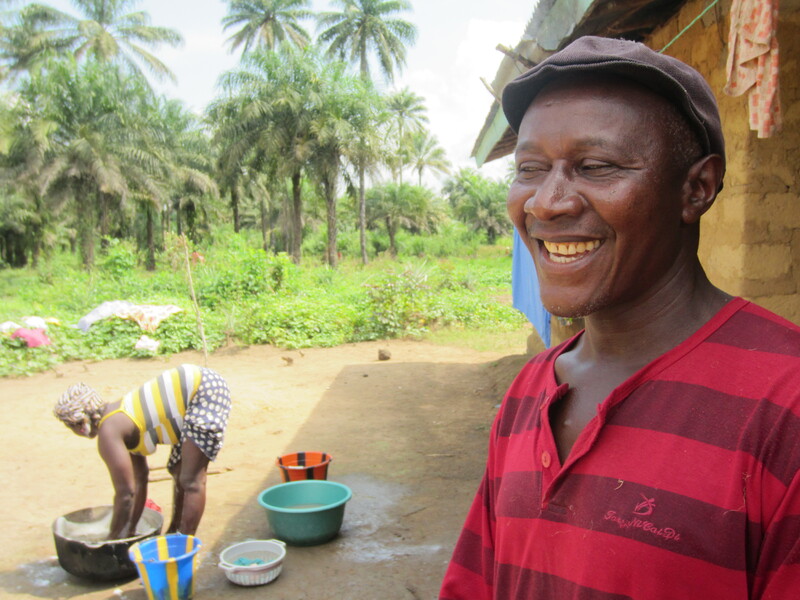 I have other children, more girls, I hope to also send to secondary school, Mr. Bangura told us with a smile. This is one of the changes I’ve been happy to find in returning to Sierra Leone after many years. Girls are now attending school in equal numbers to boys in primary school and junior high. It’s poverty that’s holding both back from completing high school. By high school, girls are dropping out faster than boys. Poverty makes marriage and pregnancy (not necessarily in that order) more likely outcomes than continuing school for many teenage girls. Sherbro Foundation’s girls scholarship program is starting to change this trend. The scholarship is coveted, and girls know they have to apply themselves in school and do well academically to keep it for the next year. In addition to learning more, the scholarships are helping keep girls focused on school and out of trouble. Student pregnancies are down, keeping girls in school longer. I asked about other scholarship students in the village. There’s another girl in the house across the way, they said. 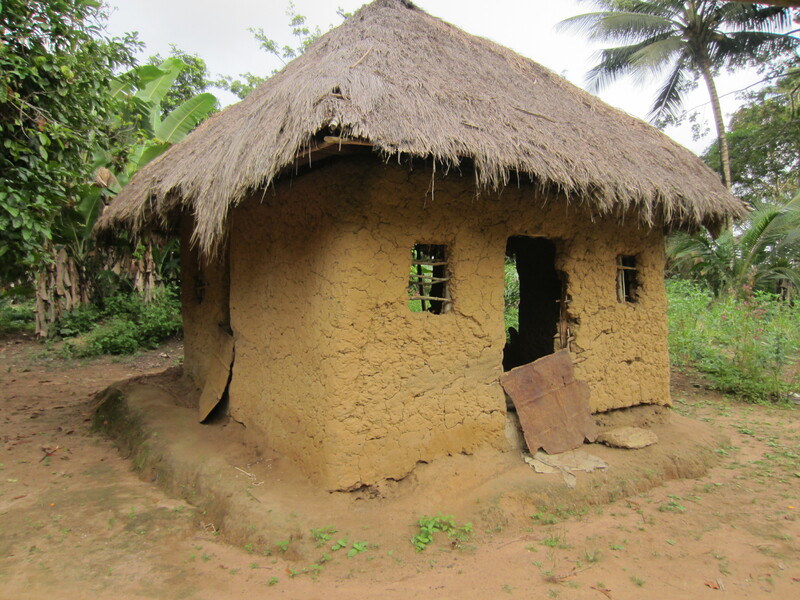 But no one was home in this thatch roofed house to meet. We next came across what looked like a tiny house. I peered in to see what kind of house could be so small. 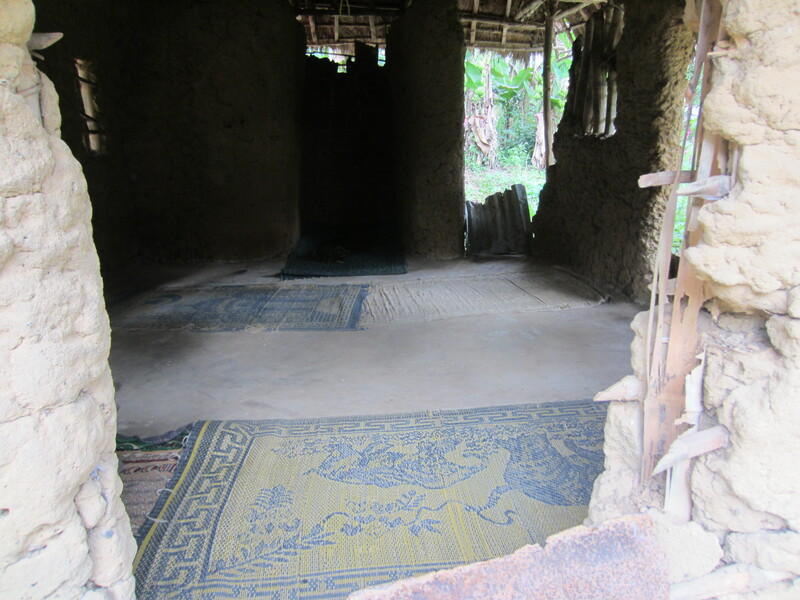 It was the village mosque. Half of Sierra Leone is Moslem. Christians and Moslems live side by side in tiny villages like this, respecting each other’s faith and often intermarrying. We could learn a lot about diversity here. 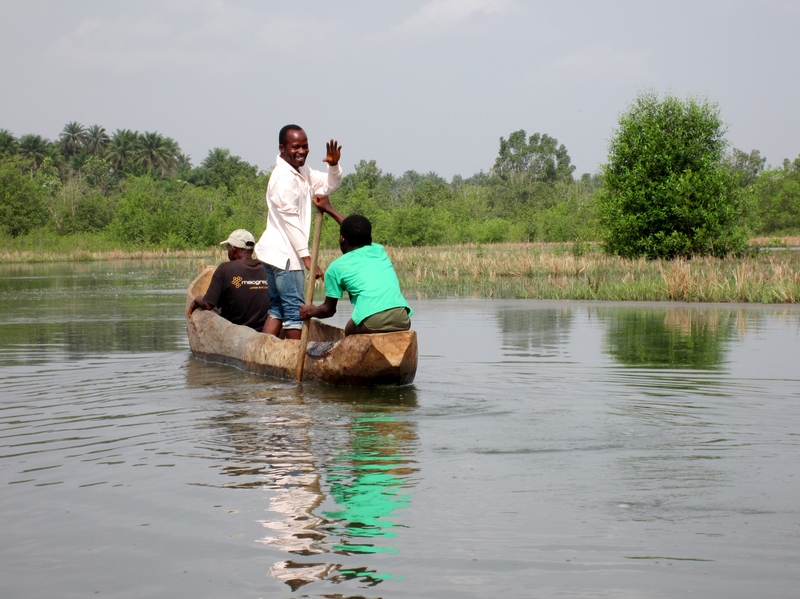 You can also enter Mokairo from the estuary that branches off the main Bumpeh River. It’s a beautiful area of swamp rice and creeks, as they call the small waterways that are deep enough to paddle a canoe. Strong tides from the nearby ocean make the Bumpeh River rise and fall twice a day, causing these small waterways to swell or decline every six hours. You have to time work according to the tide schedule and when you can navigate your canoe. 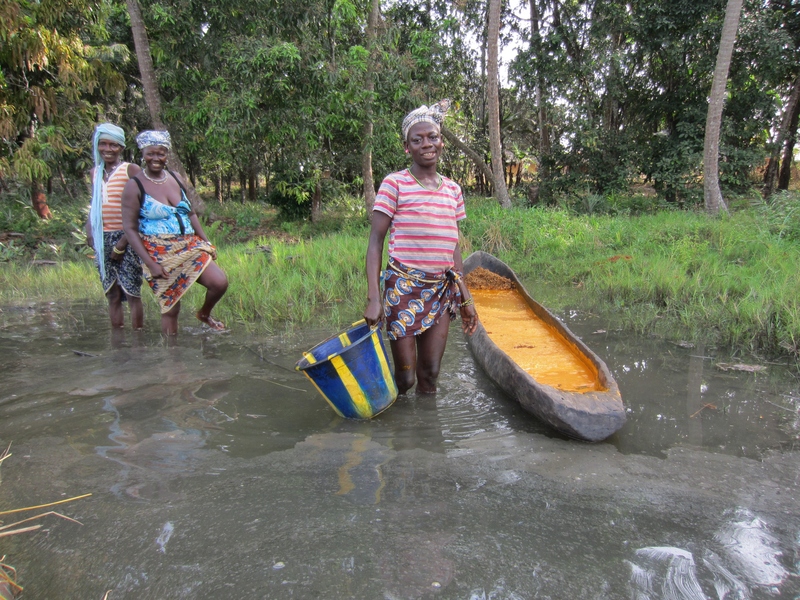 As we approached the back side of Mokairo in a canoe, I saw a woman “making” palm oil in her canoe at the edge of the village. Palm oil is the third main component of the local diet together with rice and fish. Fibrous palm fruits are first boiled with water in a drum to soften them. Then they’re mashed by hand in a canoe to separate the oil from the fibrous mash left behind. This is typically women’s work. Women will take the oil they prepare to sell in weekly markets in bigger villages or towns. You can’t mistake the neon orange color of palm oil. This is messy work and it makes eminent sense to do it in a canoe by the water. I understand the added benefit is the oil protects the wood of your canoe. Come, come, the woman working on her oil was yelling urgently to her friends. Come quickly if you want to see the woman with the skinny nose. They came running to the shore to greet me, and remark to each other about my nose. We chatted and were all laughing as we backed our canoe out and made our way back to main canoe landing. They made my day to see the palm oil work, and I apparently made their day as well, giving them much to gossip about back home. The day was winding down back on shore and we came upon a woman finishing the day’s meal for her family. Cooking on three stones with tree branches you break up with a small ax is standard. People might burn down wood to make charcoal, but they’d take that into town to sell for income. Here it’s cooking on wood. You need a shelter for your outdoor kitchen from the hot sun of the dry season, and the heavy rains of the rainy season. As we were starting our way back home, we ran into Mr. Bendu, the father of another scholarship girl. I was happy to meet him as I had heard of his daughter, Rachel. Rachel is the top student at Prosperity Girls High School. She routinely comes out first in the her class. Stands to reason. Her father is the local primary school teacher, and he takes education of his children seriously. It proves once again that a humble origin is not necessarily a barrier to academic achievement. Rachel has made good use of her opportunity to get an education. She’s now a top student in one of the top schools in Moyamba District. It was a good way to end a good day – meeting student families and seeing first hand that Sherbro Foundation’s scholarship program for girls is indeed making a difference in the lives of these girls and their families.